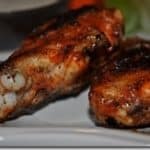 If you were to ask Keith what season it is right now, his likely response would be “football season.” With that in mind, I have a recipe for you that is perfect for eating with the guys in front of the TV while the game is on. It doesn’t hurt that our recent unseasonably warm temperatures actually make grilling in December a pleasant activity! Last weekend, as I was making my shopping list, I asked Keith if he had any dinner requests. 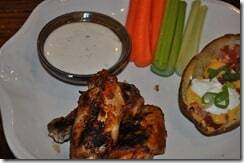 He quickly suggested Grilled Buffalo Wings and Potato Skins (with a beer or two on the side). Total man food, but it tasted very good. I added some raw veggies for a feminine touch! To make spice rub, combine all seasonings in a small bowl. Place chicken wings in a large zip-top bag and sprinkle with spice rub. Make sure that all of the wings are coated with the rub. 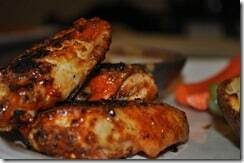 Place wings in refrigerator and allow to marinate for at least 1-3 hours. 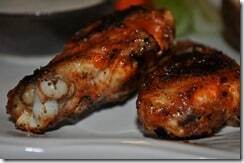 Grill wings over medium heat for 15-20 minutes, basting with buffalo wing sauce as you turn them. 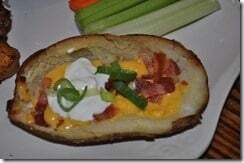 We served them with The Pioneer Woman’s Potato Skins, carrots, celery, and ranch dressing. And beer. I need one of these ASAP! Bet they’re extra delicious aswell :). Will try to make them this weekend hope they turn out half as nice as yours. Thanks for the recipe!